I read a novel because of Hawkman. As some may know, I love Hawkman. I think I love Hawkman more as a concept than as a character — there’s something indescribably awesome about a character who straps mechanical wings to his back, flies around, and beats the crap out of evildoers with his giant spiky mace — but there are periods of Hawkman history I adore unreservedly, like the Tim Truman/John Ostrander Hawkworld era. A few months ago, word went out that Warner Brothers wanted to make a Hawkman film. And this caused much discussion on bulletin boards, because when you’re talking about Hawkman, the first thing you have to ask is this — Which Hawkman? The 1930s Egyptologist? The alien Thanagarian policeman? The immortal reincarnated soul? There are so many different — and not at all compatible — takes on Hawkman that you have to ask. Obviously, I’m a fan of the Silver Age Thanagarian Hawkman, though I do appreciate the Golden Age Egyptologist, especially when drawn by the late Mike Parobeck. The immortal soul, resurrected through time to be with and love his soul mate Shiera, well… that one’s a little different. It’s not really a version of Hawkman so much as a retcon of Hawkman, a way of reconciling all the different versions of Hawkman so that there can be a single coherent history from the 1930s to today of this unique character. In the course of one of the discussions online, probably at TrekBBS, someone posted how the immortal love story of Carter and Shiera Hall, beginning in ancient Egypt and stretching into the present, was the most compelling thing about Hawkman and the movie clearly needed to focus on that. Then someone mentioned that there was novel with almost exactly that premise that had been optioned for a movie, a story about two lovers who met in ancient days who were kept apart by the machinations of fate and another immortal soul, one who sought to wreak havoc upon them across the centuries. I don’t recall that the name of the book was ever mentioned, but then on Friday at Borders, during their Going-out-of-Business sale, I chanced across an entire shelf of the book (or what I presume was the book), and I bought it, at 40 percent off. It was Ann Brashares’ My Name Is Memory. Brashares is probably best known as the writer of the Sisterhood of the Traveling Pants young adult novels, but as I’ve never read the books or seen the movies (and there’s doubtless little surprise from my readers on either point) I was wholly unfamiliar with her work. 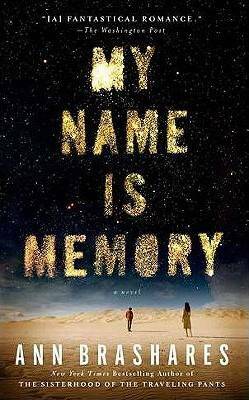 My Name Is Memory is a novel for adults, and the pullquotes from reviews cite the influences of The Time Traveler’s Wife and Twilight on the book. In 2004, a high school senior named Lucy meets a transfer student at her school in central Virginia named Daniel. He’s an odd, quiet boy, and a graduation party they have a fateful encounter. She’d had a crush on him since the moment she first saw him. He haunted her every thought. Now, face to face with him, he tells her that her name is Sophia and he’s known and loved her for over a thousand years, a thousand years that he remembers but she does not. Both intrigued and frightened, she gives in to her feelings and they kiss, but then she pulls away, and this leads the two to part suddenly on difficult terms — Lucy going to the University of Virgnia, Daniel apparently to a suicide in the Appomattox River. But Daniel isn’t actually dead, Lucy comes to understand what actually happened between them, and circumstances, to say nothing of Daniel’s immoral and immortal brother Joaquim, may bring them back together — or drive them apart forever. My Name Is Memory is a complicated book, but not a complex book. In terms of narrative, it is straightforward and linear. One narrative strand follows Lucy from 2004 to 2009 as she moves from high school to college to grad school. Running parallel, we have chapters from Daniel’s point of view, as he leads a succession of lives from sixth century Turkey to early 21st-century Virginia, sometimes meeting Lucy/Sophia, sometimes not, and sometimes facing off with his brother from his first life, Joaquim, a sadistic and brutal man who is reborn again and again. Midway through the book, for two chapters, there’s a third narrative thread, which tells some of Daniel’s story from the perspective of Lucy/Sophia as she was at that time, which explore part of Lucy’s journey from incredulousness to acceptance of the fact of her immortal soul. The two narrative threads, Lucy’s and Daniel’s, finally merge in the present late in the book (page 237, to be exact), and then we stay firmly in the present. It is also at that point that the book’s plot kicks in. The three segments of the book are very different. Lucy’s sections of the book are strangely superficial. There is occasionally warmth to them, at times her inner emotional life is sharply drawn, but the descriptions of the world in which she lives is surface. Her family, for instance, never comes into focus, and her friend Marnie, who is probably the third most present character in the book, is little more than a cypher, an honest cypher but a cypher nonetheless. Even the boy she loses her virginity to exists solely for the five pages in which it happens; he is never mentioned before then, he exists to do the deed, and then save for a late mention he’s gone from the book entirely (though I have a theory about that, which I will come back to). The only reason some of the places in her story had any weight for me was that I had either experienced them personally (like Tysons Corner) or seen pictures (like the UVA campus). Lucy’s story inhabits a fuzzy, out-of-focus world. Daniel’s sections are better written and have greater depth, even though they must sketch out an entire life in a remote century and distant country in a matter of ten pages or less. If Lucy’s chapters are basically comtemporary fiction, Daniel’s chapters are historical fiction, beginning in North Africa in the sixth century, then moving to Constantinople, Venice, and even World War I as the centuries pass and Daniel’s unique soul, which can remember all of his lives, is reborn again and again. Daniel’s chapters hint at larger stories that exist outside the book in a way that Lucy’s do not, even as she tries to piece together the story of the strange boy was who kissed her and who she was in a different life. For a book that spans a millennium and a half, the cast of My Name Is Memory is ridiculously small — Daniel, Lucy, Joaquim, Ben (a friend of Daniel’s with similar powers to recall his past lives), Marnie, Alexander (Marnie’s brother, and Lucy’s lover), and that’s it. I hesitate to list Alexander, as he appears on five pages and plays no role in the story save to take Lucy’s virginity, except that I mentioned that I was going to come back to him and so I shall. As I mentioned, My Name Is Memory leaves a number of unanswered questions. The major one, for me, was this — who led Joaquim to Lucy? It was mentioned in Daniel’s chapters that while he had kept tabs on Lucy while she was at UVA, he was careful not to interact with her or make any move that even suggested that he knew her, lest he lead Joaquim to her, setting in motion the same revenge story that had played out across the centuries. Someone did lead Joaquim to her, though, and, unfortunately, we don’t have many suspects. Joaquim would not have found Lucy/Sophia on his own; his powers are explained, and one thing he cannot do that Daniel can is to recognize a reincarnated soul in its new body. Marnie can be ruled out for two reasons; first, she was Lucy’s mother in their previous lives, and second, she actually knew Daniel. Ben can also be ruled out; he had no idea who Lucy was in this current life or where she could be. Of the characters in this book, that leaves only Alexander as a possible suspect. It’s Roger Ebert’s “Law of Economy of Characters” — no one else would or could have led Joaquim to Lucy, so it had to be Alexander that did. The question then becomes, How did Alexander fall into Joaquim’s orbit, and was his relationship with Lucy ever genuine or was it simply so that Joaquim could keep tabs on her location? (Alexander gets a late mention in the book, where Lucy’s narration indicates that they’re fuckbuddies.) I hate to belabor Alexander’s existence on the page, but it is so baffling that I can’t help but ponder it. I was also interested in the mechanics of Daniel’s financial system that spanned the centuries. It’s mentioned, and he actually uses it in the book, but I was intrigued by the fact that he would realize that he had a memory that spanned lifetimes, so he could create boltholes and money/supply caches that would and could survive the centuries. How did he come up with that insight? Were there other immortal souls with Memory that had done the same thing? Of course, that leads to the idea — what if the power brokers of the world aren’t just well-connected through their family and business connections, what if they also have memories and identities that span the centuries? It’s an obvious question, and one I considered more than once. I’m also curious where the story will go. If it’s a trilogy I can make a decent guess. Since the first book ends with the lovers unified but separated, the second book would likely turn on a shocking betrayal (probably the revelation of Alexander’s perfidy) and the the lovers torn apart (probably the death of Daniel in his current body). The third book would end with Daniel, now using Joaquim’s powers to move from body to body, finally defeating his brother once and for all (perhaps even destroying his soul, if such a thing is possible, and taking his current body), and the lovers ready to face the future together. I think there would also be some reconciliation between Daniel and some of the people that he knew, like Molly, his mother in his previous life, who is mentioned in My Name Is Memory but who doesn’t actually appear. I kept thinking about how this would translate to film, and I think much of it would probably work quite well, but it would need a serious rethink of the third act. My Name Is Memory does not end on an entirely satisfying note. I sound overly critical of the book, but in reality I’m nothing more than mildly critical. My Name Is Memory has an interesting premise, it develops it in some interesting directions, it can be evocatively written, and the book leaves you with a lot of thoughts (as you can see). But it’s not a perfect book by any means; it’s surprisingly shallow at times, the final third awkwardly meshes with the rest of the book, and the story is ultimately unfinished. My Name Is Memory was an enjoyable, occasionally moving novel, even if it had nothing to do with Hawkman, and if unusual or historical romances interest you, it’s probably the kind of book you’d enjoy.